Wigs / Blog | All about Wigs / How To Detangle A Wig! It’s the end of a long day. You have taken off your wig and have placed it carefully on your wig stand to store for the night. Then, you see it: a tangle. Not just any tangle. This may be the world’s biggest tangle. You frantically grab your styling products and comb and get to work. Let’s rewind. Are there ways to battle the tangle from the beginning? Like real hair, wigs can experience tangles. In fact, wigs can sometimes be more likely to tangle due to the lack of natural oils of your scalp that natural hair has. These oils work like a natural conditioner that defends against tangles and knots. Of course, it’s not foolproof, as anyone can attest, but those oils help. Your wigs don’t have these oils, so they need your help to stay tangle-free. Caring for your wig properly is so vital. It’s a point we hammer hard here at Wigs.com, and with good reason. A well-loved wig lives a long life. It’s really about protecting your investment. Tangles can damage your wig, but proper care can reduce them! First things first, you must not over-wash your wig. You need to shampoo and condition wigs regularly, but you can have too much of a good thing. If you have a daily wig that you don’t heavily sweat or swim in, you can easily get away with only a weekly washing. Also, in the scenario in the opening of this blog, notice I mentioned a wig stand. This is a super important accessory. Styling your wig while it is on the wig stand can go a long way in maintaining the style of the wig and reducing tangles. After washing or just a day of wear, you will want to comb out your wig. You need to use a wig comb or brush specially made for wigs. Wigs are more delicate than your own hair, so gentle motions are key. Just as you would with natural hair, you should begin detangling at the bottom and work your way up. This reduces breakage, helps to prevent combing into the permatease, and help the hair to stay healthy and smooth. 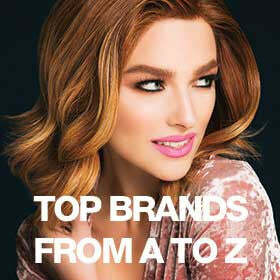 With both synthetic and human hair wigs, remember to always start from the bottom! If you are a frequent wig wearer, you probably already know the most common spot for tangles. The nape of the neck is a veritable magnet for hair disasters. The area gets sweaty throughout the day. Necklaces can cause friction and tangles. The collars of certain shirts can cause strands to collect and mat together. Some of this is unavoidable. The simplest trick you can do? Throughout the day, comb the nape area of your wig often, even if it is just with your fingers. This way, you keep on top of any tangles before they occur. One of our all-time favorite synthetic wig detangling and styling tools is a wig steamer. Jon Renau makes an amazing hend-held wig steamer that we now carry on Wigs.com! It's great for smoothing synthetic hair tangles that occur from friction, body heat or even resting your head against an office chair or car seat. An expert tip from Ellen Wille wigs stylist Dana Temesvary is to avoid using too much product (like hairspray) that keeps your wig hair stiff and unnatural looking. Even with all the care in the world, tangles can still happen just like they will with natural hair. Still, you want to take precautions to avoid as many knots and tangles as possible so that you stay looking fabulous all day long! Do you have any other tips and tricks for keeping wig tangles at bay? Tell us in the comments! Is the hand held wig steamer safe for synthetic wigs that are not heat friendly? If it is safe, how do you use it?